Can it be that Disneyland Resort is 60 years old this year? The “original” theme park will indeed celebrate its Diamond anniversary officially in July (the park officially opened July 17, 1955), and Disney being Disney they will do it in style, kicking off the celebration on May 22. The Diamond celebration will include three new nighttime events: First, at Disneyland Park there will be the “Paint the Night” parade down Main Street, U.S.A., that will include a display of new technology featuring more than 1.5 million brilliant LED lights. It will be the first all-LED parade at the Disneyland Resort. Second, there will be a “Disneyland Forever” firework spectacular, which will feature projections across Disneyland Park, Disney music and other special effects. Third, “World of Color – Celebrate! The Wonderful World of Walt Disney,” located on Paradise Bay lagoon in Disney’s California Adventure, will feature a whole new presentation of “World of Color” during the Diamond celebration. The sound and light show takes guests on a journey to celebrate Walt Disney and his dream of Disneyland with more than 1,200 fountains, lasers, special effects, an original musical score and, of course, Mickey Mouse as host. Disneyland’s Sleeping Beauty Castle and Disney California Adventure’s Carthay Circle Theatre will be decorated with giant diamond medallions. Indeed, the entire Disneyland Resort and surrounding streets will sparkle with Diamond celebration décor and banners in shades of Disneyland blue. And Disney executives promise much more to come for the 60th anniversary. In recent weeks, Disneyland has been much more in the news because of an outbreak of the measles. That could have occurred at any theme park or public place, of course, but the media attention has it all centered on Disneyland, sadly. Indeed, I had been to the park just a week or so before the news broke and was completely unaware of the story. Disney officials say almost all of the cast members who were infected have recovered and have now returned to work. Last month I got the chance to visit Disneyland with two friends who had never been there, Ashley and her three-year-old daughter Aurora. Indeed, I realized I hadn’t been to Disneyland for more than 10 years myself, but it was great to see the adjoining parks, Disneyland and Disney’s California Adventure, once again. We spent much of our first day at Disneyland in the original theme park going on rides suitable for a three-year old, a day I described in my column last month. But on the second day we began the morning with a traditional character breakfast at Goofy’s Kitchen at the Disneyland Hotel. It’s always a challenge with younger kids to see whether they are frightened of the “larger than cartoon-size” Disney characters or not, but Aurora seemed fascinated if also a bit shy around Goofy, Mini, Pluto, Chip n’ Dale and others. Fortunately, she finally got into the spirit of the character interaction. You never know with kids this young. 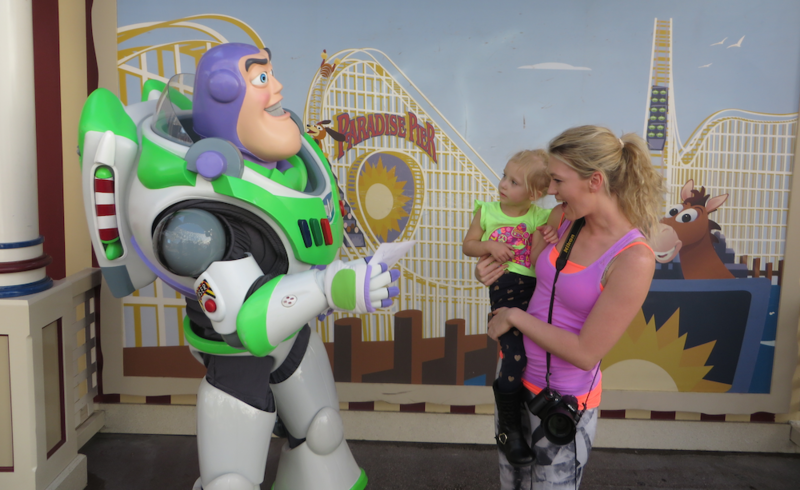 Our next mission was “To Infinity and Beyond,” otherwise known as finding one of Aurora’s favorite characters, Buzz Lightyear, who we had been told would be appearing later in the morning at Disney California Adventure. Armed with the location and time, we took the short walk from the hotel to the park and headed back to the “Paradise Pier” section. We got there a bit too early and then debated whether to wait on line for one of the nearby attractions. Ashley wanted to go on the giant Mickey’s Fun Wheel, a Ferris wheel with a giant Mickey face on it, but because the cars actually move even as the wheel moves, we thought that might not be the best for a three-year-old—or me! So we settled on Toy Story Midway Mania, a “4D” attraction where you ride around in cars and “shoot” at different targets while being assisted by Toy Story characters. That proved to be a real hit with Aurora, even though she needed a little assistance getting those targets. Her mom, however, proved to be a crack shot! Afterwards, we did indeed meet up with Buzz Lightyear just around the corner and Aurora’s eyes lit up as she gazed at him, larger than life. The only downer: Buzz apparently can’t sign character autographs due to the limitations of his space suit. Oh well! We rounded out the morning by heading over to “A Bug’s Land,” which actually has some of the most kid-friendly attractions in the park. We tried out “Francis’ Ladybug Boogie and Heimlich’s Chew Chew Train and more, all rather sedate rides but perfect for three-year-olds. We had a late lunch at Cocina Cucamunga Mexican Grill and then decided to try out only two or three more rides before heading back to rest at the hotel (we had learned out lesson the day before when Aurora pretty much passed out after a full day at Disneyland Park). We tried out the Golden Zephyr rocket ship ride, a replica of one of those classic California pier attractions and one that is suitable for all riders. And we spent some time trying on large Mexican sombreros in a courtyard where a mariachi band was playing. And for smaller kids, that kind of thing sometimes is the most memorable part of the visit. Ashley clearly wanted to try the Grizzly River Run rapids, but that wasn’t open to smaller kids like Aurora. After a few hours rest back at the hotel, we ventured out again for dinner at Blue Bayou, a restaurant located on New Orleans Square in Disneyland. I had never been to it before, so we enjoyed the movie set-like ambience as we watched the boats float by for Pirates of the Caribbean in the distance. With that kind of incentive, we clearly had to try the Pirates ride, an old favorite of mine but one that Ashley and clearly Aurora had never experienced. It’s a little dark for kids, but Aurora actually seemed to enjoy it, terrified as she might have been. Emboldened by that experience, we decided to try the Haunted Mansion. Sounds crazy for a three-year-old, but we were in luck: The attraction had been rethemed for the holidays with Nightmare Before Christmas décor and Christmas music, so Aurora seemed to like it. For our final event, we tried to hold out for a 10:30 p.m. showing of “Fantasmic,” the sound, light and music show that features a large sailing ship and the famed Mark Twain Riverboat both cruising by filled with characters, all overseen by Sorcerer’s Apprentice Mickey Mouse. It’s a terrific show that really does bring the evening to a close—and just our luck Aurora slept through the whole thing! The next day, as we packed up the car to leave Disneyland Resort, one of the bellmen who was helping us started up a conversation with Aurora, who seemed more than eager to tell him her favorite experiences in her two-day adventure. When the bellman asked her about her favorite attraction, she blurted out Finding Nemo, the submarine voyage that turned out to be our first attraction on the first day! At the time, Aurora appeared to be terrified during ride. I guess every three-year-old gets a lot braver after two days at Disneyland Resort!